When Bath and Body Works has a sale on their candles on top of an already on-going Fall sale, and I have a 25% off coupon for my entire purchase, you know i'm going to take all out advantage on that! First up is the Nectarine Green Tea candle from their Summer Sips line. This candle smells of deliciously fresh and juicy nectarines with the slightest earthy note of green tea. And since I am completely obsessed with Market Peach, l decided to give Harvest Peach a try. This one still has those juicy peach notes but is definitely warmed up with the scent of spices. I hope this burns nicely! Both candles were only $11.25. 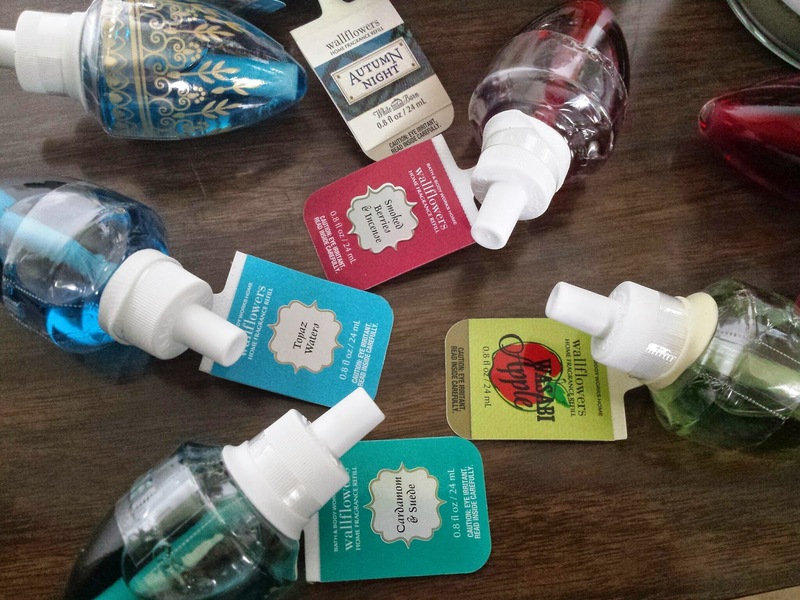 It was also a good time to stock up on some hand soaps and I choose 3. The last one I picked up was Golden Apricot for something nice and fresh for the kitchen. All of these 50% off so they were only $3.25 a bottle! I had to stock up on some actual cold weather candles so the first one I picked up was Fresh Balsam in their winter packaging. I probably won't be burning this till it gets closer to December and I have a Christmas tree up, but this fresh pine tree scent just makes me feel like snowboarding and being out in the mountains looking for that perfect Christmas tree, lolz. The next one I picked up was Marshmallow Fireside in their fall packaging that comes with the cutest lid cover that has a golden leaf attached to it. I like this scent because even though it is a sweet scent, it isn't overly sweet and this one doesn't make me feel sick when I smell it. It is warm and toasty and makes me feel cozy all over when I smell this =) . The last candle I picked up was something not quite 'wintery' but definitely nice and fresh, as the name would suggest. Renew & Refresh is lightly scented with Jasmine, mint and what you would think of almost fresh linen, but lighter. I love the blue jar it sits in which makes it more aesthetically pleasing and the scent is perfect for calming the senses. 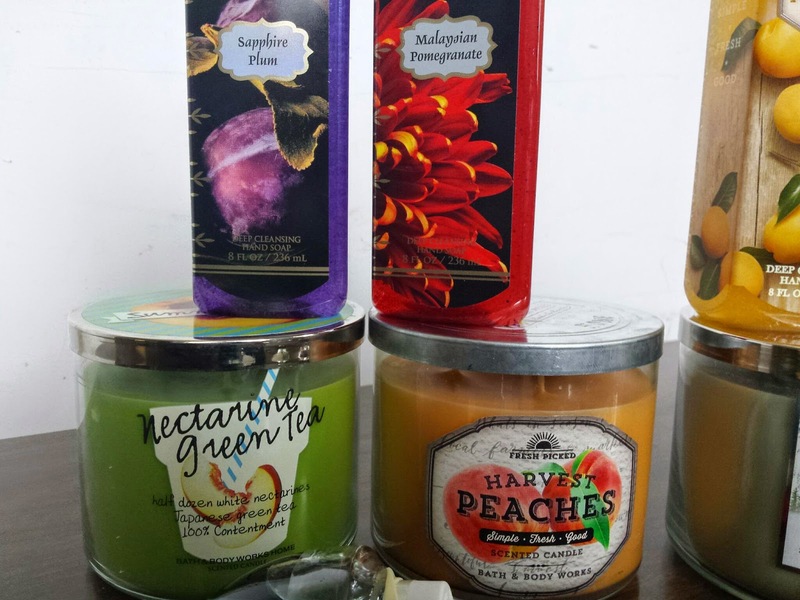 Each candle was $11 (with 25% off so around $9). Of course, when they had a bunch of Wallflower plug-ins for 50% off, I picked up few too! I picked up a few scents that were warmer (like Cardamon and Spice, Smoked Berries and Incense, and Autumn Nights) and some more refreshing ones (like Topaz Waters and Wasabi Apple). I love having these around the house and switching up the scent without having to burn a candle sometimes! 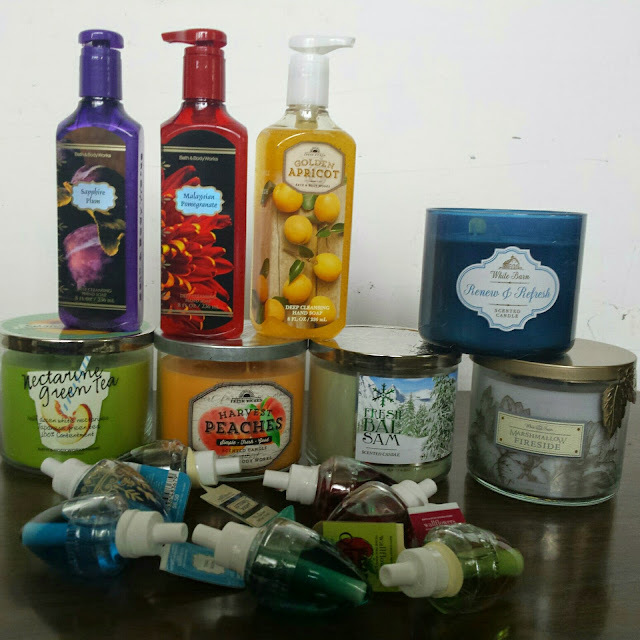 Readers, do you like Bath & Body Works candles? Soaps? Lotions? 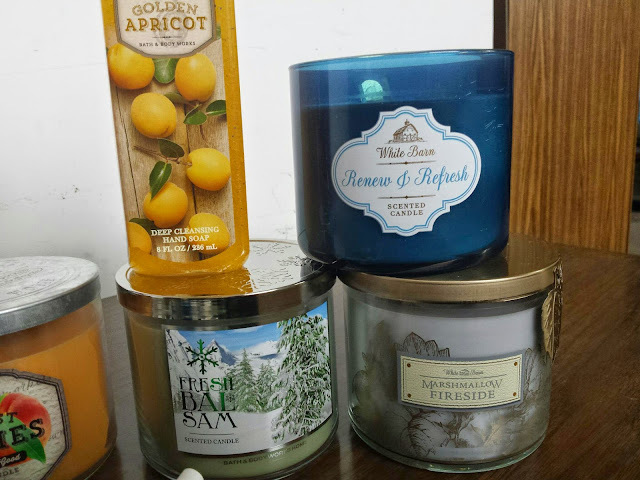 What are your favorite scents? Let me know! Thanks! I'm such a sucker for the deals! Indeed they do! It was soo hard to decide which candles to get without buying every single one! I got the Malaysian Pomegranate hand soap this weekend as well and it smells SO GOOD. Love that line!